I suspect that most regular users have a deep affection for the boats they sail on, an affection so strong that certain undesirable characteristics of this maritime relationship are over looked, forgiven or just put up with because it’s part of the package. There must also be in some instances a characteristic that just needs to be put right, but in a sympathetic fashion. 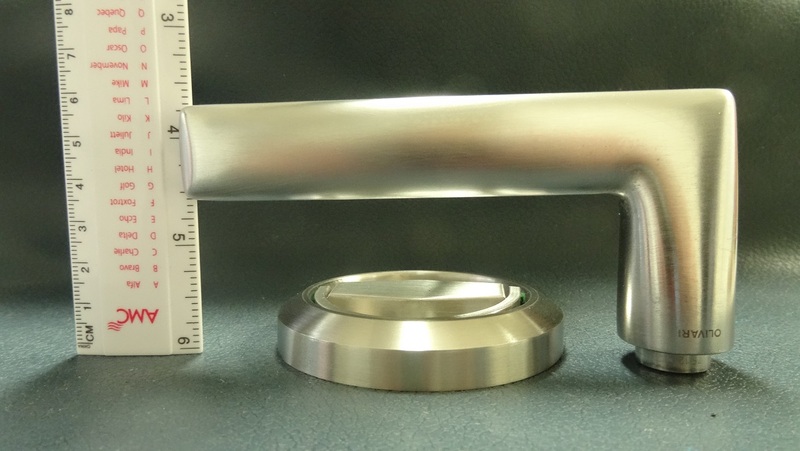 One characteristic, that falls in the last category, with the Elan 340 are the door handles, these beautiful satin finished stainless steel items would do justice to an up market house, we are not too sure exactly why or how they found there way on to a 10 metre sailboat. These handles protrude from the door by more than five centimetres , weight about 350 grams each, and are more than just a nuisance, they can be dangerous. They were a characteristic that we could not put up with, but one that had to be rectified in a sympathetic fashion. Like a lot of others we utilise the V berth as a sail locker when racing, most of the time sails are removed and replaced via the forward hatch but on many occasions sails are passed through the saloon to and from the cockpit, inclement weather/sea conditions, loading or unloading before and after racing or after spinnaker repacking, inevitably the door handle would get tin the way. From a personnel point of view these handles also posed a hazard, their shape and protrusion has caused a number of minor injuries, mostly bruising, but in a couple of instances something a little more frightening. Anyone familiar with the Elan 340, I suspect something that is in common with most modern sub 35 foot performance cruisers, would know that the room in the heads is a little restricted, when showering, the door handle can de quite a threat to bodily safety. 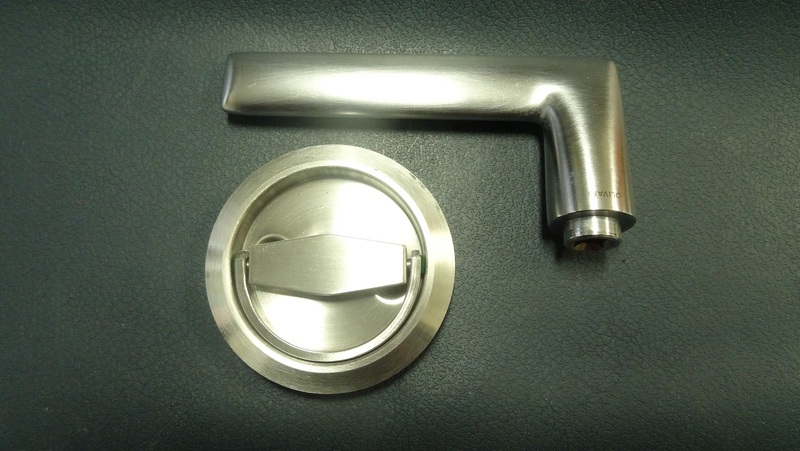 We have now replaced the beautiful Italian satin finished stainless steel Olivari handles with almost flush fitting circular units, also satin finished stainless steel, from a Chinese source. We hope that Elan will forgive us. Compare the handles in the following photographs. 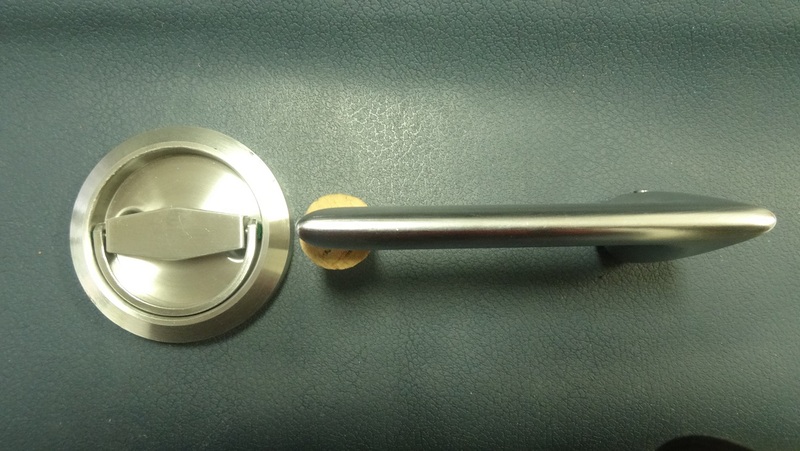 Comparison: Original door handle and new flush (almost) handle.